On Monday 01 May 2017, The High Commissioner of Pakistan Her Excellency Naela Chohan hosted a Lunch in the honour of Pakistan junior hockey team who created history by winning the title of Australian junior hockey championship with a hard fought 3-2 win over New South Wales State in the final on Saturday at Hobart,Tasmania. The Lunch was held at Mercure Sydney Airport hotel and attended by Pakistani community dignitaries and team players & officials. The Deputy High Commissioner Dr. Khalid Ejaz was MC of the event. Team Manager Tariq Mir thanks High Commissioner for giving honour to Pakistani youngster players and hope for historical performance in Olympic games. 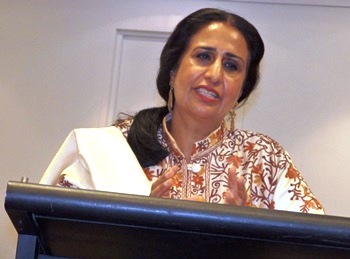 Host High Commissioner Naela Chohan made a unique example against the VIP culture and eat lunch after all players and guests. The High Commissioner of Pakistan H.E. Naela Chohan congratulates Pakistan junior hockey team for wining Australian national hockey title. She said that success of the green shirts wrote a new chapter in the national hockey by winning a domestic title on a foreign soil. The High Commissioner said Pakistani team were the deserving winners of the tournament where they had to play as many as eight matches; won seven and lost one. She hopes for the bright future of Pakistani junior hockey team players and pray for their success. The High Commissioner of Pakistan H.E. Naela Chohan congratulated Pakistan Junior Hockey Team on winning gold medal in Australia. She felicitated to the all players and officials Kamran Ashraf, Tariq Mir, Mudassar Ali khan & Razia Rizvi, Asim Abbasi & Sohail Rizvi who performed well during the tour of Australia. H.E. Naela Chohan hoped that young players would keep up the winning spirit in future.